For decades WSU environmental researchers have translated findings from basic research into recommendations that help businesses and cities decrease their environmental impact. A few key examples are highlighted below, and were on display at the CleanTech Showcase. Boeing and The Nature Conservancy gave a presentation on reducing impacts of stormwater runoff, the number one source of pollution affecting the health of Puget Sound. Municipalities and stormwater permittees, which include industries vital to Washington’s economy, are charged with managing their stormwater runoff to protect aquatic life and water quality. As a co-manager of the Washington Stormwater Center, WSU helps these regulated entities by conducting research, developing tools and providing education on best practices to mitigate the effects of stormwater pollution. 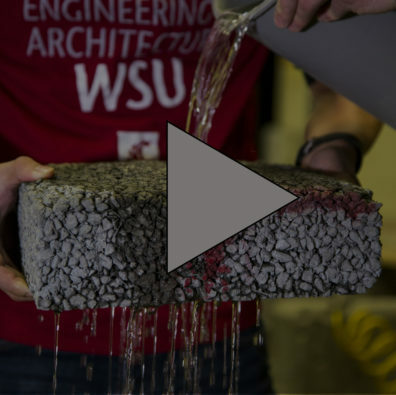 The presenters gave an example of these efforts, highlighting WSU and Boeing’s joint research to develop stronger green infrastructure by incorporating recycled carbon fiber composites into permeable pavement. The permeable pavement naturally filters stormwater back into the soil, removing pollutants and recharging groundwater supplies. Watch The Nature Conservancy video on stormwater runoff and WSU’s research. As cities in our region and beyond continue to grow, energy and natural resources will be increasingly in high demand. Showcase presenter Urbanova is a smart city living laboratory in Spokane that aims to be a proving ground for people-centered solutions to urban challenges. Urbanova facilitates cross-sector collaborations that lead to healthier citizens, safer neighborhoods, smarter infrastructure, a more sustainable environment and a stronger economy. WSU is a key member of the consortium of utilities, technology companies, local government, and universities. WSU’s research expertise in air and water quality, smart systems, and the power grid will help Urbanova collect and analyze data that lead to better understanding of a city’s environment and health risks. For instance, a team from WSU’s Laboratory for Atmospheric Research (LAR) is partnering with Itron and Avista on Urbanova’s pilot smart streetlight project. The WSU team is installing sensors on smart streetlights that will help assess air quality’s role in a healthy city. Kim Zentz, lead of Urbanova & director of WSU’s Engineering and Technology Management program, presents at CleanTech Showcase. WSU’s NSF I-Corps program prepared academic entrepreneurs for the next steps in their efforts to start companies based on a discovery in the lab. 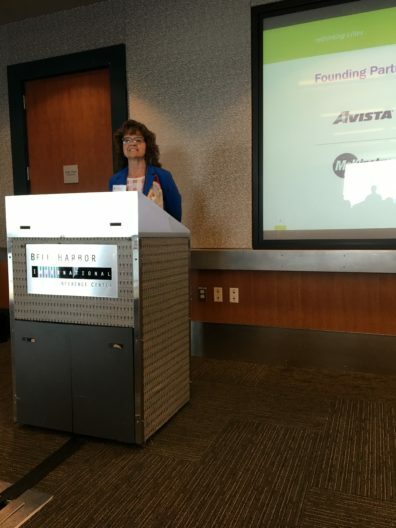 Two of the companies – BiBMy and 3DbioC – are participating in the Cascadia CleanTech Accelerator run by the CleanTech Alliance and Oregon BEST. A third – Semplice – gave a pitch during the lightning round, inspiring interest from angel investors who were present. The resources offered in-house through I-Corps are critical to preparing the new entrepreneurs for accelerator programs, networking events and other steps needed to start acquiring funding. Researchers from WSU’s Composite Materials and Engineering Center are working with small companies to develop and test sustainable building materials that could introduce new industries to the Northwest. At Showcase, WSU presented with Katerra on their joint project to develop a cross-laminated timber industry in Washington. CMEC researchers are supporting the new company’s efforts to perfect the product and potential supply chains that would revitalize jobs in rural Washington, and introduce a cleaner construction material to urban cores. WSU’s booth at showcase also included samples of composite panels made from recycled wind turbine blades. The samples are from joint research between WSU and Global Fiberglass Solutions, a small company dedicated to reducing waste and getting more use out of high-value materials. Now that they’ve validated turbine blades can be broken down and turned into a composite useful in other industries, CMEC researchers are helping the company scope and plan manufacturing plants in Washington and Texas. Once again, thanks to the Clean Tech Alliance and its sponsors, the CleanTech Showcase was a great success. 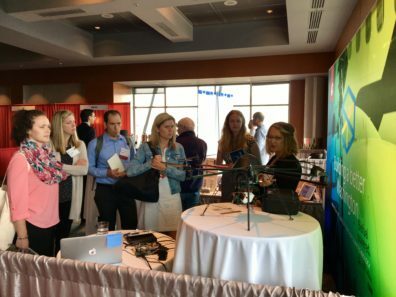 The Showcase provides a useful way for WSU to share its research and outreach capabilities with current and potential partners across the region. Learn more about the Clean Tech Alliance here and about WSU’s cleantech portfolio here, and contact ann.goos@wsu.edu if you’re interested in learning more.